Civil Service “Reform” Should Embrace the Merit Systems Principles – The Alternative Is Much Worse. | Kalijarvi, Chuzi, Newman & Fitch, P.C. While pursuing a series of proposals to overhaul Federal compensation and benefits, the Administration also intends to partner with Congress to cull statutory and regulatory rules that have over time created an increasingly incomprehensible and unmanageable civil service system. The Administration will propose changes in hiring and dismissal procedures to empower Federal managers with greater flexibility. This echoes President Trump’s request in his first State of the Union Address that Congress “reward good workers and [remove] federal employees who undermine the public trust or fail the American people.” Based on these grandiose policy statements alone, it is difficult to determine how broadly the White House intends to overhaul the federal civil service, or who the White House imagines will constitute the next generation of civil servants. Given some of the President’s statements, there is a concern that he was referring to loyalty as a necessary requirement for the civil service. As with most things, the devil is in the details. Before making any dramatic changes, the White House and Congress should consider the history of the civil service and why federal employee protections are so important to national policy. Before the modern civil service system, the federal government operated in large part on a spoils system (“to the victor belongs the spoils”) tracing its roots back to Andrew Jackson. At the beginning of his administration in 1829, Jackson removed nearly 10% of the federal workforce in the name of reform and efficiency. In reality, Jackson had promised government positions to his supporters in return for their political support, and he needed to purge the bureaucracy in order to make room for his supporters. The results were predictable. By 1842, U.S. Senator Garrett Davis described the spoils system as “the greatest and most threatening abuse that ever invaded our system,” adding that it makes the president “the great feudatory of the nation and all offices fiefs, whose tenure is suit and service to him.” Later, in 1881, a disgruntled job-seeker shot President James A. Garfield after being rejected by his administration. The assassin, Charles Guiteau, felt the president owed him a patronage position for his assistance in securing Garfield’s election. …to provide the people of the United States with competent, honest, and productive workforce…and to improve the quality of public service, Federal personnel management should be implemented consistent with merit system principles. 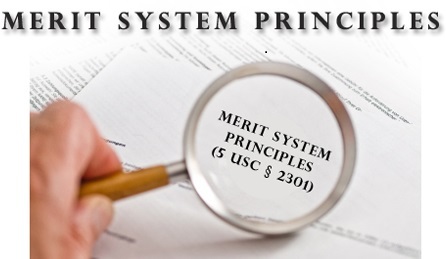 The merit systems principles are designed to ensure fair and open recruitment and competition and employment practices free of political influence, discrimination, or other nonmerit factors. 5 U.S.C. § 2301. They are strong principles that reflect our values as Americans. Moreover, the law already provides for both rewarding excellence and removing underperforming employees. 5 U.S.C. § 2301(b)(3), (6). While it may be tempting for this or a future administration to move away from the merit systems principles in favor of a system that would allow the president greater authority to staff the civil service with his or her allies, history has shown that such systems are inherently prone to abuse. The public should be skeptical of any effort that raises the risk of returning to a spoils system. The country is ill served by an underpaid civil service with fewer skills and less institutional memory to fulfill each agency’s mission. As former Deputy Secretary of Labor Chris Lu explained, career employees, i.e., employees not selected because of their political affiliation, “are the backbone of ensuring that programs are implemented, people are kept safe, and the government performs its role in providing economic opportunity.” We would do well to keep it that way. PreviousAre You Entitled to Due Process When You Apply for a Security Clearance? NextNondisclosure agreements for Hill interns set a double standard compared with Congressional mandate for executive branch and paid Hill employees.